It’s been two months since I’ve posted any musings here. (My apologies.) That horrifying fact occurred to me this morning—after several weeks of distracting, time-consuming work on a wholly different project—when I realized I’d missed National Handwriting Day, celebrated on the birthday of John Hancock, who was born 278 years ago yesterday. And in that stream-of-consciousness way my brain works, I found myself soon thinking about Button Gwinnett, of Georgia, perhaps the least conspicuous signer of the Declaration of Independence. 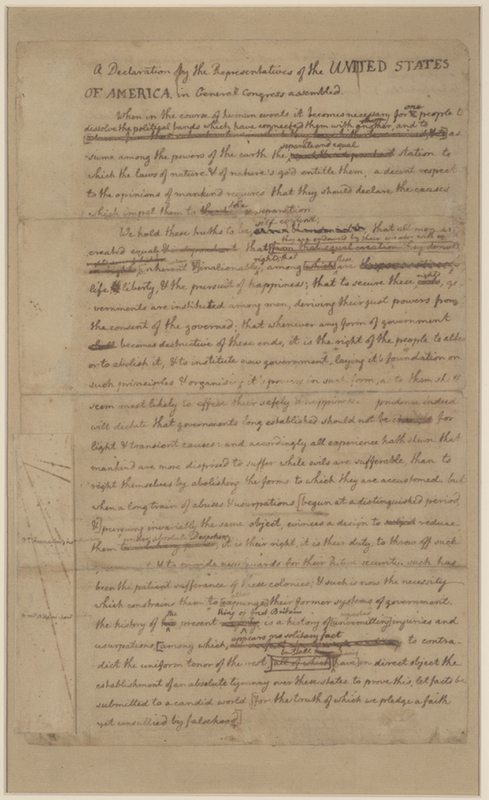 Jefferson’s draft of the Declaration. 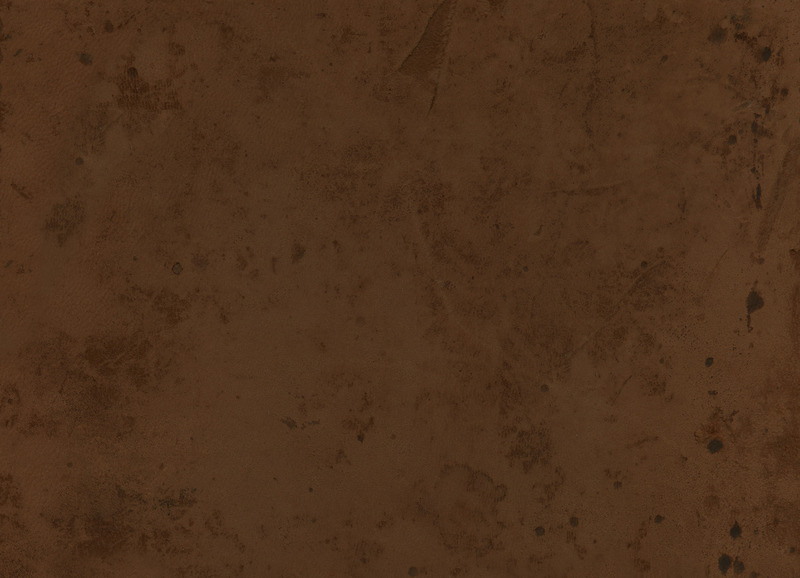 I spent dozens of hours staring at a copy of the Declaration of Independence while working on my American Scribe font back in 2003, yet I have no memory of seeing the signature of a man named Button. Not until I listened recently to a Radiolab podcast [aside: if you haven’t listened to Radiolab, you must] that featured Gwinnett did I have any recollection of his name at all. And yet—as Radiolab explains—his is the most valuable signature of them all. That’s because he died in a duel soon after the Declaration was signed. And rich people like to collect all those signatures. No more than fifty-one of Gwinnett’s are documented, two of them at the Houghton Library at Harvard. Stream-of-consciousness took me then to those fifty-six Declaration signatures, and the early American leaders who wrote each other letters in longhand—it seems just about every day. And their handwriting, which I’ve looked at from time to time. George Washington to the Ministers of the Reformed Protestant Dutch Church. [T]ake pains at the same time to write a neat round, plain hand, and you will find it a great convenience through life to write a small & compact hand as well as a fair & legible one. 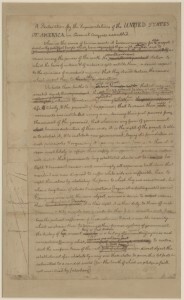 Of course Jefferson’s draft of the Declaration contrasts sharply with the famous, finely engrossed version by Timothy Matlack. 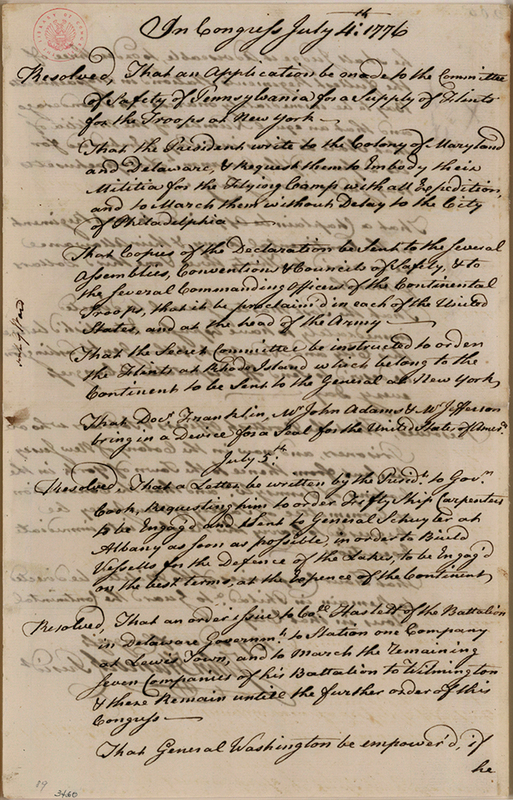 I visited the Library of Congress website and tracked down some examples of George Washington’s penmanship, which is frankly rather handsome. As it should be, I suppose, all things considered. 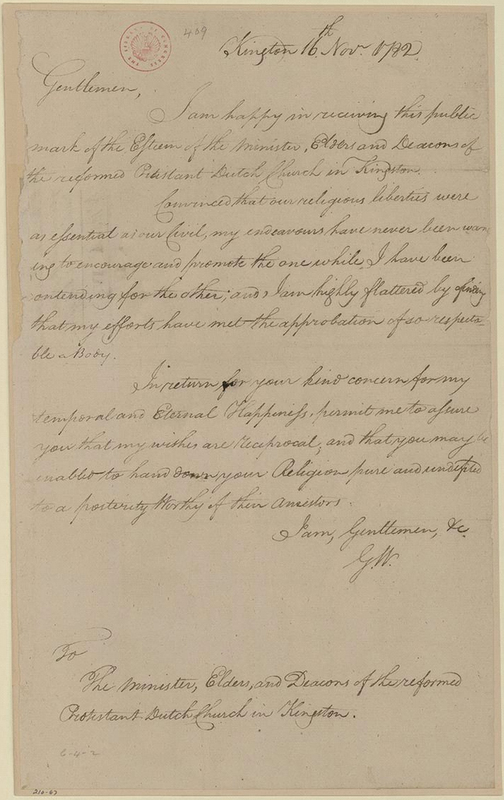 And I looked again at John Adams’s, a script I glimpsed a lot while designing the Abigail Adams font—the Massachusetts Historical Society has copies of the amazing correspondence those two carried on—and one that is none-too-fancy but surprisingly legible. Let’s see, who else? How about James Madison? Not a Declaration signer, but an early leader and president. Well, again, nothing too fancy—his handwriting seemingly dashed out in a hell of a hurry, and not overly legible, much like Benjamin Franklin’s. 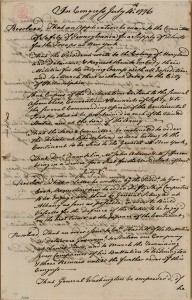 John Hancock, extract from Journals of Congress, 1776. 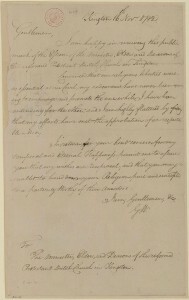 Hancock himself definitely rocked a stylish brand of cursive, even when he wasn’t sending a message to the King of England: bold, dark, with a confident flourish. As for Button Gwinnett—not much of his penmanship survived the destruction of Savannah in both the Revolutionary and Civil Wars. Still, he had a neatly stylish signature. Stream-of-consciousness now carries me away to thoughts of our current crop of movers-and-shakers. Just how many of them write by hand at all? A couple hundred years from now, what subtle clues will people of the future have into the personalities of our long-dead generation? Must they simply go by YouTube videos? One thing’s sure: there’s a lot more than written communication going on as we manually string letters and words together, applying subtle pressures with a pen. Button Gwinnett signature and seal. You are currently browsing the The Antique Penman blog archives for January, 2015.